With MSX-MIDI, MIDI functionality and BASIC extensions were added to MSX-MUSIC to enable it to use MIDI. Unlike MSX-MUSIC, there is no BIOS. Non-BASIC MSX-MIDI programs directly access the hardware from the I/O ports. MSX-MIDI can be both built into the machine body, or an external cartridge. MSX MIDI is only available to MSX turbo R and later. It can not be used on MSX, MSX2 and MSX2+. These ICs can be accessed through the I/O ports. In case it is built-in, it is placed in the same slot as the MSX-Music (slot 0-2, page 1). In case it is an external cartridge, it is included on the cartridge. When the BASIC extensions are used, it is initialized to use external cartridge’s MSX-MIDI instead of the built-in MSX-MUSIC. Between internal or external MSX-MIDI, the hardware configuration and access methods and such is different. What follows is a description of the MSX MIDI hardware configuration. Additionally, regardless of whether timer IC 8253 or 8254 is used, it will henceforth be referred to as “8253”. For 8251 command / mode register writes, a recovery time of at most 16 clock ticks (at 3.579545MHz) is necessary. When writing to the command / mode register continuously, please insert a wait to allow the 8251 to reinitialise. By writing 00H, 00H, 00H, 40H to I/O port 0E9H, the 8251 is reset. It will no longer function as MIDI if an incorrect mode value is configured, so after a reset always set it to a specific value. For more information, please see the attached sample program (THRU.MAC). The interrupt from counter #2 is released by writing any data to address 0EAH. Is used as the 8251’s baud rate generator. A 4 MHz clock signal is input to the CLK pin. For the 8251, it must be configured to transmit a baud rate clock of 500 KHz (divided by 8). Use mode 3 (square wave divide-by-N mode). Can be used as general-purpose counter. The output of counter #2 is input to the CLK pin. Used as a periodic interrupt to the CPU (used by BASIC for 5 ms interval interrupts). Normally, mode 2 (divide-by-N mode) is used. OUT2 pin goes low, and through the latch circuit a CPU interrupt is generated. A 4 MHz clock is input to the CLK pin. The external MSX-MIDI interface’s I/O port address can be changed by setting a value to I/O port 0E2H. Set bit E8 to 0, and the external cartridge MIDI interface’s I/O ports change from 0E2H to 0EAH, becoming compatible with the internal MIDI interface. Also, the 8251’s I/O address becomes 0E8H and 0E9H. Set bit E8 to 1 and the 8251 interface addresses will be 0E0H and 0E1H, and access to the cartridge’s I/O ports 0ECH-0EFH will be prohibited. Additionally, the 8253’s timer interrupt is also inhibited. In case bit 0 of MAIN ROM address 002EH is 1, the MSX-MIDI is internal. In models whose MAIN ROM version number (002DH) is 03H or more, the features of the MSX-MIDI can be used with an external cartridge. In the internal type and the external type, the hook is different. This distinction is important in order to create an application. For hooks, please see 3.2 “Hooks” and chapter 4 “Application development”. To make the distinction between internal type and external type, examine the string starting at MSX MIDI ROM address 4018H. In external cartridges, the 4 unspecified bytes at 4018H are different for each manufacturer. The data at 401CH consists of “MIDI”. In case MAIN ROM address 002EH bit 0 is 1, the MIDI interface is internal. If it exists, the external cartridge is inserted. When the above cases do not apply, since there is no MIDI interface, the MIDI function can not be used. In case the ROM version number is 02H or less, the MIDI interface can not be used. 1/60 sec (NTSC) or 1/50 sec (PAL) interrupts have been used for the MSX-MUSIC, but in the MSX-MIDI BASIC extensions 5 ms interrupts from the 8253 are used. In case of external cartridge, because these hooks can not be used, please use H.KEYI. Usage details are described in chapter 4 “Application Development”. The hooks are different depending on whether MIDI is built-in or external. When setting up a hook, please check if the type is internal or external. When enabling interrupts, such as after MIDI interface initialization, because there is a possibility that the interrupt flag has already been set, the interrupt flag must be reset. 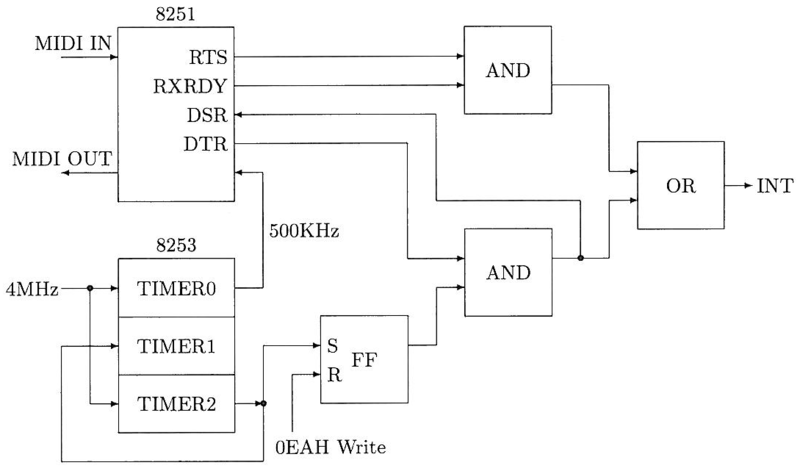 With the external cartridge, other interrupts besides MIDI IN and 8253 timer also come from H.KEYI. Therefore, the interrupt handling routine must detect what kind of interrupt the current interrupt is. Whether or not it is a MIDI IN interrupt can be checked in bit 1 of I/O port address 0E9H. Whether or not it is an interrupt from the 8253 timer can be checked in bit 7 of I/O port address 0E9H. At the shortest, the MIDI IN receive interrupt occurs at 320 µs intervals. When calling an interrupt handling routine from the hook with the RST 30H instruction, the inter-slot call takes time to process and will not complete in time for 320 µs interval reception. For MIDI interface and hook set up / tear down, please refer to the included sample program (THRU.MAC).